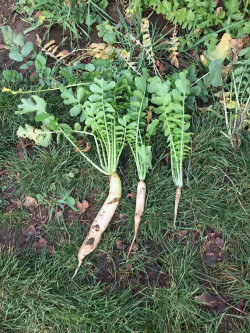 Fodder Radish & drilling dates: Left hand one drilled 31st July; the middle one on 14th August and the small right hand one on 30th August. The effect of early or late drilling on cover crop and root development can be dramatic. Photo taken at Limagrain's Innovation site in Lincolnshire by Hubbards Seeds.